Hawaii is one of the most picturesque locations on this planet. For many people, it’s the closest thing the Earth has to a genuine paradise. With beautiful beaches, lush jungles, warm weather, and friendly people, Hawaii is a fantastic place to visit and there’s a whole host of activities tourists and travelers can enjoy if they decide to stop off at the Aloha State. The state is divided up into eight main islands and one of the most popular spots to visit is Kaua’i. Geologically speaking, Kaua’i is actually the oldest of all of the main Hawaii islands and boasts some truly incredible scenery. Many visitors to the island tend to congregate in the Wailua area. This is a small, beautiful spot on the eastern coast of Kaua’i. The "Sleeping Giant" Nounou Mountain is one of the key natural landmarks in this location and various hotels and amenities can be found for residents and travelers. 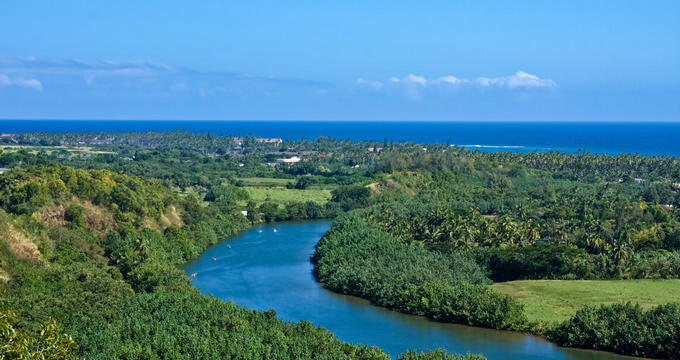 The Wailua River is also located here, and it's the number one spot for kayaking in all of Hawaii. In fact, as the Wailua River is the only navigable river in the entire state, this is the only spot to enjoy inland kayaking not just on Kauai, but on any of the other islands too. Kayaking in Wailua is very popular with families and various kayaking tour and rental companies operate in the area, offering guided expeditions along the river. Going on a guided Wailua kayaking tour is a great idea, especially if this is your first time in the area. Some people do prefer to simply rent some kayaks and head off on their own adventures, and this method has its advantages too, but it’s important to check a map and be sure of your route to avoid missing out on any of the important landmarks. Here are some of the best kayaking tour and rental companies in Wailua. If you want to get the most bang for your buck, Kayak Wailua offers some of the lowest priced kayaking tours in all of the Wailua area. This is a family owned and run company that has been operating on the island of Kaua’I for several decades. Staffed with friendly guides and using only the best kayaks and kayaking equipment, Kayak Wailua offers thoroughly professional kayaking tours from start to finish. These Wailua kayaking tours run for around five hours on average and take in some of the top sights of the Wailua area like an old Hawaiian village and the Secret Falls, which are accessed by a small hike. Kayak Kaua'i is easily one of the top kayaking tour companies in Wailua. The company’s good work was even recognized with an appearance on National Geographic’s Adventure magazine and many satisfied kayakers have posted rave reviews of this operator online. Kayak Kaua’i offers a five hour Sacred Falls Tour complete with a stop off and hike through the jungle to allow all the visitors to get a good look at the famous waterfall. As well as tours, this operator all runs Wailua kayak rentals and is one of the best names to choose for families with young kids.